The mushroom chicken pie we shared that night was tasty. Although it took longer than I cooked rice, because I made the pastry by scratch, it’s worth every ounce of effort though. Me: I just don’t want to have rice for dinner, love to have a pie instead. You’d understand how I felt surprised if you knew him as much as I do. He has grown up to be a man who almost can’t live without rice for dinner. If you don’t have enough time to make your own pastry, you can use the cheat’s version in the note section if you’re craving for this delicious homemade pie. Sift flour and salt into a large mixing bowl. Add diced butter and stir with a knife. Rub the butter into the flour with your finger tips, lifting the flour from the bottom up on top, until the mixture looks like coarse breadcrumbs. Mix in lemon zest. Add 2 tablespoons of the chilled water and lemon juice to flour mixture. Add the rest of the chilled water bit by bit until the mixture comes together into a ball. The dough should leave bowl clean. Turn the dough onto a lightly floured surface and lightly knead by hand until smooth. Don’t over knead the dough. Divide into two balls, one larger in size for making the base, with another one smaller for making the top. Roll into two disc shapes. Wrap in plastic wrap and chill in fridge for about 25 to 30 minutes. Heat oil over medium-high heat. Saute onion until softened. Add bacon and cook until oil is released. Saute garlic and cook until aromatic. 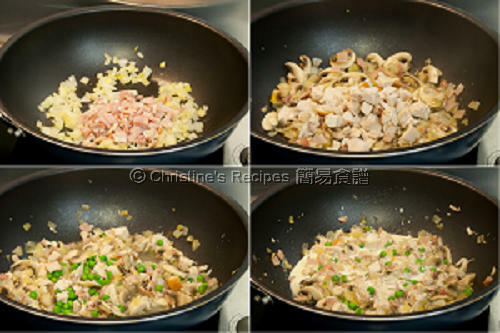 Add mushroom and chicken. Sprinkle thyme and combine well. Cook until the mushroom turns soft. In the meantime, mix 2 tablespoons of chicken stock with 3 teaspoons of cornflour. Set aside. Pour the rest of chicken stock into the mushroom and chicken mixture. Bring it to a boil. Continue to cook for 2 to 3 minutes. Stir in the cornflour mixture and cook to your preferred consistency. Add whipping cream. Season with salt and pepper. Turn off the heat. Transfer the fillings into a large bowl and let it cool for a while. Remove the larger dough disc from fridge. Place on a lightly floured surface. Use a rolling pin to roll out into a circle slightly larger than the mould. Carefully line the mould. Trim the edge. Save the trimmed dough for decoration. Prick the base with a fork. Line with baking paper and place ceramic beads, or beans, or rice on top. Transfer to the preheated oven for blind-baking, about 15 to 20 minutes, until the edge becomes lightly brown. 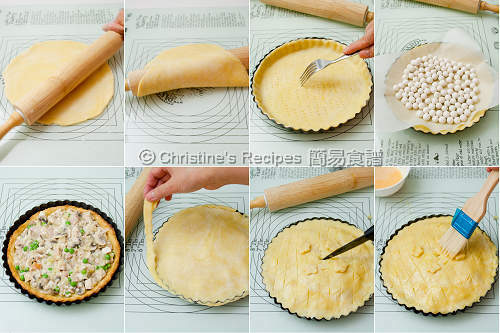 Remove the pie shell from oven. Remove the beads and baking paper. Roll out the smaller dough disc into a circle similar to the size of the mould. Spoon the fillings into the shell and cover with the dough disc. Crimp the edges to seal and score the top pastry. Cut two slits in the middle of the pie. Use the trimmed dough for decoration. Egg wash the pie. You can skip the steps for making pastry from scratch if you don’t have time. 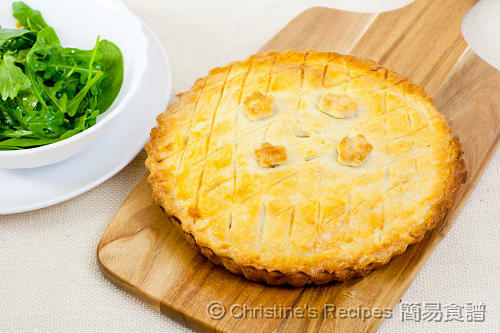 Simply use the ready-made short crust pastry from supermarkets. All you have to do is to cook the fillings and pop it into your oven. Wash your hands before making pie pastry. It helps reduce your hand warmth. Thus the butter won’t melt too quickly. A large electric mixer can do this job with less fuss if you have one. Don't over knead the pastry dough. The crust won’t be crumbly otherwise. You can make the fillings a day ahead. Store in fridge with cover. When you’re ready, simply spoon it into the pie. What a lovely pie. Pastry crust always eludes me but I am going to give it a try again. Thanks! This pie looks lovely. Pastry crusts always eludes me but I am going to give this a try. Thanks! This looks absolutely divine! I've always loved chicken pie so I must give this a whirl. What a stunning pie! This is definitely comfort food at its best! That looks delicious, I love the crust, looks so flaky. I don't mind having this yummy pie for dinner too! What a beautiful and yummy pie. Lovely colour too. It's always worth the effort of making your own pastry, right? Thanks for sharing this winter comfort food. Hi, I made your 'put chai ko' with red bean and my family enjoyed it. Thanks for sharing your recipe. Glad that your family liked the snack. Thanks for the shout-out. Hi Christine, want to try out your recipe so much!! Can I ask If I do not have whipping cream, are there other alternatives to add in place of it? Tia! Eileen. To make the fillings, using whipping cream will bring out the best result. You can use light or heavy cream. You might replace the cream with milk. And use cornflour with water to cook with the mixture in order to thicken the sauce. We Asians can't live without rice so I totally understand the predicament! But pie for dinner is reasonable and by the looks of it, delicious as well! 2) Which/what types of ceramic beads/rice/beans to use? 1) To bake the crust first is to avoid from being too soggy after adding some fillings. 2) The ceramic beads is for blind baking. You can get them from any bakery shops. Or you can use any beans or rice that come handy to you. 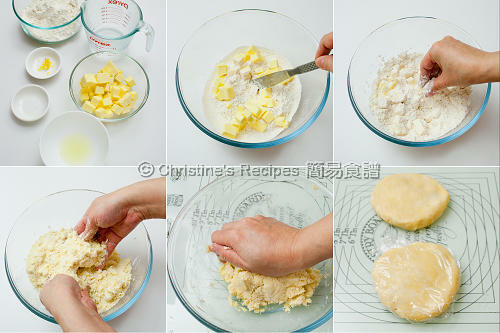 The idea is to add some weights on the pastry to prevent from puffing up while baking. 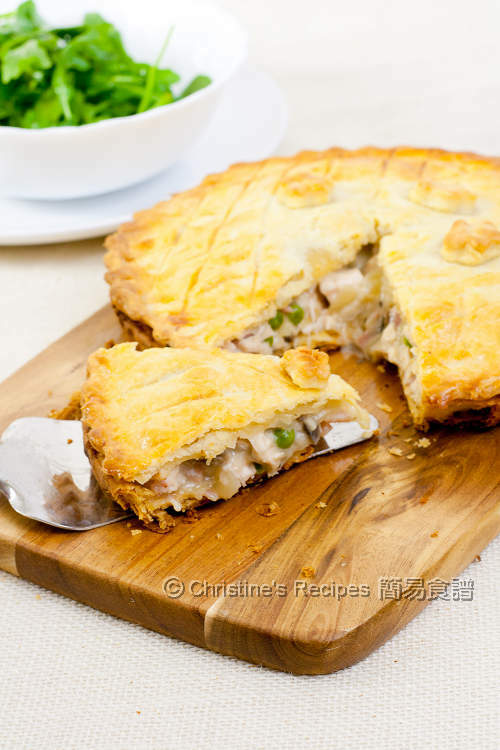 i tried ur pie yesterday.. it was awsom.. dunno hw to thank u..
hi christine.. i wanna thank u so much for the recepie.. so easy nd tasty.. thx a lot for puttin it up.. i think am gonna try all ur stuff lol.. So glad that you liked my recipe. Lovely pie very tasty,looking at the recepie bacon was included in the ingredients but not in the making,was this an error? Hi christine, Pie was lovely,noticed bacon in the ingredients but not included in the making,was this an error in print.I added it and was delicious. Oops, left bacon out by mistake. Updated the recipe. Hi Christine, thanks for the recipe! I'm trying to bake the day before an event - which is better? 1) bake the whole pie in the oven first and then put in the fridge till next day (then re-heat in the oven/microwave), or 2) put the chicken in the pie crust, seal it with the other dough disc, put in fridge/freeze the whole uncooked pie before taking out the next day to bake in oven? Hi Christine, thanks for your recipe. I'm baking the day before an event - would love your advice on which is better: 1) complete baking in the oven and put in fridge until next day, take out to re-heat with oven/microwave oven, or 2) put the chicken into pie crust, seal with dough disc, put into fridge/freeze until next day before taking out to start baking? Either way will work well. The end results will not be too different. You might only consider whether you want to reheat or cook through it the next day. 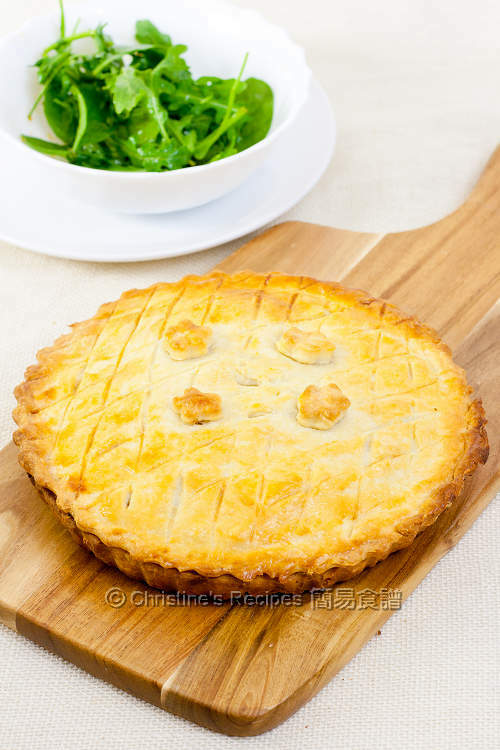 Hi, im from s'pore, I like ur pie vr much, and wish to make it for my family..
May I know bake the bottom crust must on the top and bottom heat? Then bake the top must on both heat also? Can I keep the dough in freezer for few days, and defrost it when I need it? No problem. The dough can be kept in freezer up to a few weeks. I used a 7-inch round removable bottom mould. So much work involved in making a pie from scratch! But definitely worth the effort when you dig into the mouth-watering pie. Exactly worth every ounce of effort, Veronica. This pie is so delicious.